Comprehensive review of MuscleTech NITRO-TECH Whey Isolate Lean Musclebuilder. See what real experts and actual users have to say about this protein powder. Despite the “marketer-speak” name, MuscleTech NITRO-TECH Whey Isolate Lean Musclebuilder is actually a really good protein powder. This protein powder has 30 grams per serving, which is a good quantity for those looking to build some lean muscle mass. There is 3 grams of creatine per serving, which has been shown to help build muscle, especially when combined with whey protein. The creatine is a definite perk! It also has 6.9 grams of BCAAs, 5.3 grams of glutamine and precursor, and 3.2 grams of leucine per serving. All of these are great additions if you’re looking to build some muscle mass. For maximum results, they recommend taking 4 servings per day for at least 6 weeks. This would tack on 120 grams of protein per day, along with creatine and beneficial BCAAs for muscle recovery and growth. The carbs, calories, and fat content are relatively low, which may also help build lean muscle mass. However, this protein powder does contain milk and soy, which may be an issue for some people. It also has sucralose, an artificial sweetener, which may lead to bloating and stomach pain, especially when taken in higher amounts. We definitely saw some of these side effects, too, so just keep that in mind. Also, be sure you’re drinking 8 to 10 glasses of water per day. The cholesterol content is a bit high at 70mg per serving, which is about 23% of your RDA. This might be something to keep in mind if you’re taking 4 servings daily. So overall, we gave MuscleTech NITRO-TECH Whey Isolate Lean Musclebuilder 4 out of 5 stars, which makes it an above average protein powder. MuscleTech NITRO-TECH Whey Isolate Lean Musclebuilder is actually super easy to use. Even with just a spoon and water, it mixed up surprisingly well. It’s a little on the watery side, which I prefer a smoother, thicker consistency. However, when I used almond milk and a shaker, it came out pretty well. The directions say to mix 1 scoop with 6 oz of cold water or skim milk or 2 scoops with 12 oz of liquid. It suggests mixing in a glass or a shaker. 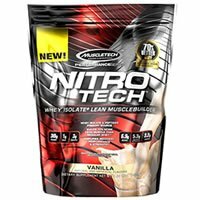 We tried MuscleTech NITRO-TECH Whey Isolate Lean Musclebuilder in Vanilla. We weren’t huge fans of the taste. It definitely has the classic protein powder taste, which just isn’t that palatable. When mixed with just water, it’s also pretty sweet (and not in a good way). It’s not the worst taste ever and if you’re not picky, it should probably be fine. I suggest mixing it with almond milk, skim milk, or soymilk. It also comes in a ton of other flavors like cookies and cream, milk chocolate, brownie cheesecake, mocha swirl, strawberry, and vanilla birthday cake. For the macros, each serving contains 30 grams of protein, 2.5 grams of fat and 4 grams of carbs. If you’re looking to build lean muscle, this protein amount should be suitable for that. It also has a relatively low carb, fat, and sugar amount, which is something we always like to see. There are 160 calories per 1 scoop/serving. This is about average as far as calorie content goes. Overall, this is a pretty decent macro combination for those interested in gaining some lean muscle mass. MuscleTech NITRO-TECH Whey Isolate Lean Musclebuilder has some things we like about their ingredients, and some things we don’t. The main protein source is an isolate protein and peptide blend (whey protein isolate, whey peptides, whey protein isolate 97%) and it uses whey protein concentrate as the small remaining source. Whey protein isolate is a quality protein source, especially for building muscle. They use a multi-phase filtration process for the whey that helps remove fat, lactose, impurities, bacteria, sugars, and unwanted minerals. Both whey isolate and whey peptides are quickly and easily digested and absorbed in the system. It also contains 6.9 grams of branched chain amino acids (BCAAs) and 5.3 grams of glutamine and precursor, which may help aid in muscle growth and recovery. 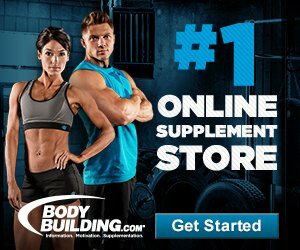 Creatine is also added (3g per serving), which some studies show that creatine combined with whey has greater muscle building effects than whey alone. It also has a higher amount of cholesterol, about 23% of your RDA in 1 serving. This may be something to keep in mind if you take the recommended amount for maximum results, which are 4 servings per day. This protein powder also has artificial flavors and sucralose as the sweetener. Sucralose helps keep the sugar content low, at only 1 gram per serving, but sucralose is an artificial sweetener and may cause some digestive upset and bloating in certain people. I did see side effects with this protein powder. I had some stomach pain and belly bloating about 30 minutes after taking this protein powder. It wasn’t the worst thing ever but it definitely was noticeable. It does contain milk, soy, and sucralose (a sugar alcohol), which may tend to give some people side effects if they are sensitive to any of these ingredients. Once we used this protein powder for a while, we’d say it’s best suited for those looking to build lean muscle. It has 30 grams of protein per serving, which is a great amount to help build muscle and get in that extra protein. The directions say to take 4 scoops daily (120 grams of protein total) for at least 6 weeks to see the maximum results. This protein powder also has 3 grams of creatine per serving, which when combined with whey protein, may be even more effective at building muscle and increasing strength. MuscleTech NITRO-TECH Whey Isolate Lean Musclebuilder costs $23.99 for a 1-pound bag. That works out to about 7.9 cents per gram of protein, which is about average as far as what most protein powders cost. Unfortunately, we couldn’t find any type of guarantee on their website but you might be able to get a refund if you buy it at Amazon or at certain retailers. To buy MuscleTech NITRO-TECH Whey Isolate Lean Musclebuilder, click here.